What does the Body Merry Hyaluronic Acid Serum do? This pure and natural serum provides intensive hydration to your skin and minimizes fine lines and wrinkles giving a more radiant, dewy and youthful glow to your complexion. The powerful antioxidants in this facial serum help to reverse the signs of damage caused by the sun and by free radicals, minimize skin discolorations and resolve uneven skin tones. The result is that your skin looks and feels rejuvenated and your complexion is smoother and suppler with a much younger, fresher appearance. Replaces moisture in your skin. Reduces fine lines and discolorations. Who should use the Body Merry Hyaluronic Dew Serum? This hyaluronic acid with vitamin C serum is suitable for anyone who wants to reverse the signs of aging and re-hydrate their skin. So anyone who has dry, patchy skin, whose skin looks tired and damaged by the weather or who has a few fine lines and wrinkles appearing can really benefit from the punch of super hydration this hyaluronic acid serum will give your skin. You can even use this facial serum to help keep your skin hydrated and ward off the aging process, caused by free radical damage and a lack of moisture. The Body Merry Dew Serum is appropriate for vegans (because it is natural and organic and the hyaluronic acid is derived from plants not animals) and is suitable for all skin types. Once you have thoroughly cleansed your face, first add toner if this is something you normally do and then use your fingertips to apply a small amount of the Body Merry serum to your face and neck. Once the serum has absorbed into your skin, you can then apply your favorite moisturizer and makeup if required. You can use this serum daily in the morning in conjunction with the Body Merry Pro-A Serum at night. If you have very dry skin, it is best to make sure that you always use a moisturizer after applying this hyaluronic serum. Maximum size – 2oz bottle with dropper. This serum is free from parabens, fragrances, sulfates, phthalates, skin irritants and alcohol. It is made in the USA at an FDA registered facility, is not tested on animals and is suitable for vegans (the hyaluronic acid is plant based). This product contains hyaluronic acid, vitamin C, green tea, Aloe Vera and jojoba oil, witch hazel, MSM, geranium essential oil and vitamin E.
Hyaluronic Acid is a common ingredient in facial serums, because it can absorb more than 1000 times its weight in water. It is what is known as a super hydrator and provides your skin with intense hydration. Our skin naturally produces hyaluronic acid and that is one reason why a baby’s skin feels so beautiful and soft. 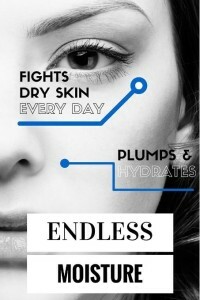 The problem is that as we age, our production of hyaluronic acid decreases, resulting in skin that is dry and coarse. Replacing the hyaluronic acid is essential to rejuvenating our skin and giving it a brighter, fresher and more youthful appearance. Hyaluronic acid not only hydrates your skin, but it also bathes collagen cells in a nourishing fluid. In fact, as the amount of hyaluronic acid reduces in your skin over time, the collagen also dries out. This is a big cause of your skin sagging, because the lack of hyaluronic acid prevents the collagen from working properly. So increasing the amount of hyaluronic acid in your skin, helps to super moisturize your skin, but it also reduces also those fine lines and wrinkles, as well as making your skin more toned and supple – as the collagen comes back online. Hyaluronic acid is also a major component in dermal fillers, used by plastic surgeons to plump up facial tissues and give you a more youthful, rejuvenated complexion. Vitamin C is a super antioxidant that is essential component in wound healing and cellular repair. It is also extremely important in reversing the signs of aging caused by free radicals and promotes the production of collagen. Vitamin C helps your skin to have a smoother and more even complexion, reduces hyper-pigmentation, age spots and sun spots and adds a healthy and vibrant glow to your skin. 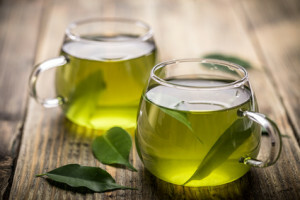 Green tea is an even stronger antioxidant than vitamin C and so the value of your antioxidants is boosted by having both of these ingredients in your serum. This ingredient also helps to remove the dead cells from the surface of your skin, clearing away that old, tired look to your skin and giving your complexion a softer texture. With green tea in your facial serum, your skin looks healthier, clearer, more even-toned and much fresher. PROS: With 92% of all customer reviews giving this hyaluronic acid serum a 4 or a 5 star rating, you can’t really go wrong with this product. The general consensus is that this serum is an awesome moisturizer, is very affordable (a super 2oz bottle), is very simple to include in your beauty routine, is not oily, absorbs quickly into your skin and gives your complexion a radiant glow. I’ve been using this product for almost three weeks now, and my dark circles are GONE. Oh, and dry skin? Not! I am literally touching my face right now and it’s as smooth and moisturized as my 1 year old’s skin. I love this stuff. It gives me a healthy glow and leaves my skin super soft. I used if for the first time after the derma rolling my face. I love the thicker texture of the liquid and my skin looked instantly softened and hydrated! I’ve been using this item combined with vitamin c serum for a month and see amazing results. My skin is tighter and complexion is much clearer, even my skin tone is improved. 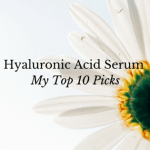 CONS: Hardly anyone has given this hyaluronic acid facial serum a poor rating. The only concerns were from customers whose skin felt too oily or irritated after using this product or who didn’t see any real difference in their complexion. 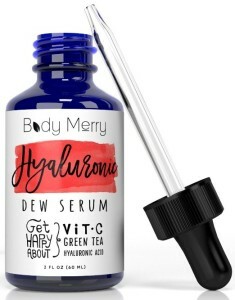 Does the Body Merry Hyaluronic Dew Serum work? 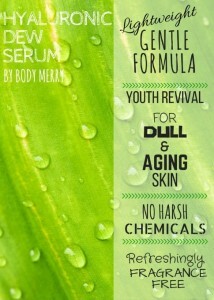 Body Merry Hyaluronic Acid Serum is a sure winner with hardly any negative comments from customers. The combination of hyaluronic acid with vitamin C and green tea is definitely a successful formula – one which helps to freshen and hydrate your skin, giving you back a more youthful, radiant glow. 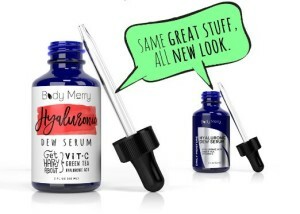 Body Merry also produce a Pro-A Serum, which they recommend you use alongside their Hyaluronic Dew Serum. They offer a 90 day 100% money back guarantee and you don’t even have to return the bottle! Australian shipping: This product does not ship directly to Australia – check out my shipping guide for easy shipping options to Australia.